RDDs and REDs are similar enough to categorize together, but are very different threats. RDD stands for Radiological Dispersal Device. These are usually a "dirty bomb", or a conventional explosive combined with radioactive material. They are a shock and awe type weapon with lasting repercussions and damage. The perpetrators would usually claim responsibility for a RDD “dirty bomb”. RED stands for Radiological Emitting Device. These are usually unshielded radioactive material placed in a hidden area meant to do damage over a long period. They are a silent and sneaky weapon, usually reserved for assassination attempts and silent attacks against fixed areas. The attacker would usually not claim responsibility due to the hidden nature of an RED. While both devices are lethal weapons, they are not as severe as others due to their limited size and effectiveness. The instantly lethal portion of an RDD is the release mechanism- usually an explosive. The remaining radiation exposure can be treated medically and prevented by staying away from the affected area. An RED, while difficult to detect, does not pose any instant threat and requires multiple exposures or prolonged exposure to do significant bodily harm. While the radiation exposure can kill, there is also the possibility that radiation sickness symptoms will develop before a lethal dose of radiation is received, which will allow the victim to get away from the device. Neither device can affect a large area, region, or entire country which makes them have a limited severity. The major implications of an RDD or RED attack would be the surprise factor, and the elevated fear factor of a radiation release. No. As mentioned before when taking a look at the severity, an RDD or RED has a limited scope and range. While the terror aspect of an attack can send shockwaves through a community, it will not be enough to cause destabilization of society. Difficult to Create: Getting a hold of nuclear material and the means to disperse them is not the easiest task. Creating biological or chemical weapons is much easier for those without many resources. Difficult to Deploy: Both types are hard to get into position. An unshielded high powered RED or RDD could kill the would-be attacker before it is even set up. Easy to Mitigate: Dirty bombs are mitigated by evacuating the area and cleaning it for radioactive debris. While difficult, it can be accomplished. REDs are mitigated by locating, identifying, and containing the device. Your specific RED risk is based largely on your standing in your community and your job type. Public figures and government/military officials are at a slightly higher risk. RDD dirty bomb risk is tied to urban areas and military installations. If you are located in one of those two areas, your risk is slightly elevated for an RDD attack. The nature of RDDs and REDs make them meant to catch you off guard. Planning for incidents and specialized kits are some of the more important preps for dealing with these threats. Identifying whether or not an incident involves radiation is the difficult task. The Boston Marathon bombing was feared to have been a dirty bomb for a period of time after the attack, which slowed the overall response to the incident. Radiation protection and detection equipment really comes in handy for these types of attacks. The basic bug in or bug out plans work well for RED/RDD incidents. They cannot threaten more than a region at a time, and are easily mitigated once identified. As mentioned before, identifying the actual attack, isotope type, and radiation exposure is most of the battle. Whether you are staying informed with communication equipment, or have your own radiation detection equipment- knowing your threat is the most important part of staying safe from and RDD/RED. If you are unsure of the impact of an event, it is safest to wear your protective equipment and keep it on until you are certain there is not threat of radiation exposure. 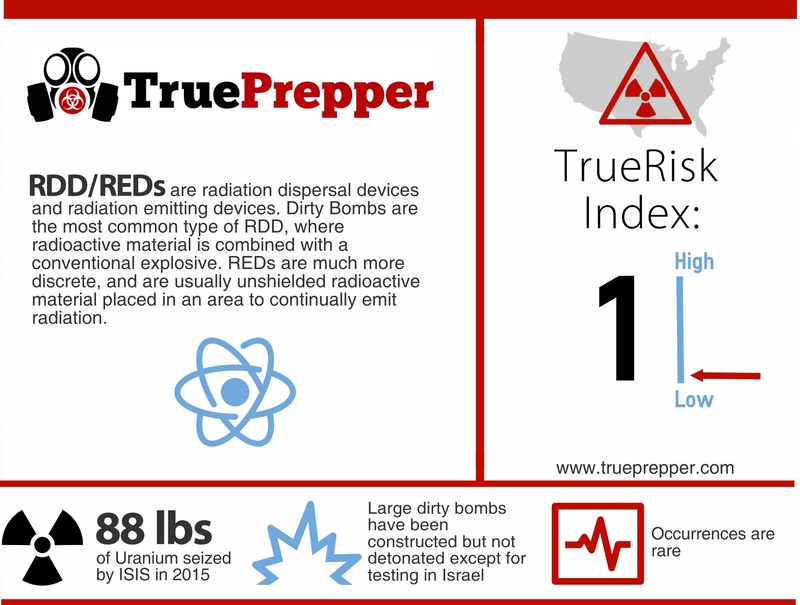 A RDD or RED incident is pretty easy to ‘clean up’ unless it was a dirty bomb detonation. You just need to shield and remove the radioactive isotope from any vulnerable area. If it was dirty bomb was used, the area will likely be cordoned off and not accessible for a long period of time due to the isotope dispersal. Radiation will continue to be present at the location of the blast long into the future.